At first sight, it’s easy to mistake a plantain for a banana. Although they look a lot like bananas and are close relatives, plantains are very different. 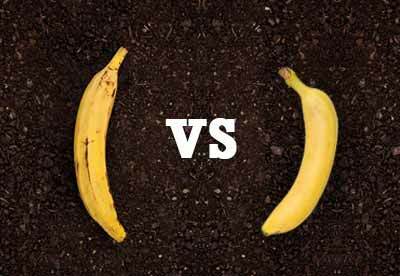 24 Oct Banana vs Plantains: What’s the Difference? At first sight, it’s easy to mistake a plantain for a banana. Although they look a lot like bananas and are close relatives, plantains are very different. They are not always sweet, and are used as a starch in many recipes, especially in Latin American, African, and Asian cuisines. Plantains are sold in the fresh produce section of the supermarket, usually resembling large green bananas although ripe plantains may be black in color. Plantains are also longer than bananas and have thicker skins. Bananas are edible fruits produced by various large, herbaceous plants in the genus Musa. Bananas are typically used in North American and European cuisine, although they’re originally from Southeast Asia. Bananas have a long, slender shape and are covered by a thick skin. Bananas can be eaten raw or cooked, though they are traditionally eaten raw. The outer skin is green, tough and difficult to peel when unripe. As it ripens, the skin changes to bright yellow, and the edible flesh of the fruit becomes sweeter. It is then followed by a dark brown color and becomes progressively easier to peel. Unlike the banana, plantains must be cooked prior to eating. There are many ways to consume the plantain – it can be steamed, boiled, grilled, baked or fried. They are starchier and lower in sugar than bananas which makes them much more versatile as a cooking ingredient. They are often used in a meal just as one would use a starchy vegetable (such as potatoes) depending on the stage of ripeness. Plantains can be eaten and taste different at each stage of development, though the interior color of the fruit will remain creamy, yellowish or lightly pink. When the peel is green to yellow, the flavor of the flesh is bland and has a starchy texture. This is the optimal stage to make savory foods such as tostones, which are versatile, tender, and crunchy. As the peel changes to brown or black, it has a sweeter flavor and more of a banana aroma but keeps a firm shape when cooked. When prepared at this stage, plantains can be used to make sweet, filling, and satisfying platanos maduros. While bananas and plantains may look alike on the outside, you’ll find it’s easy to tell them apart after tasting them. Bananas can be eaten raw or cooked, but plantains must be cooked prior to consuming. Plantains are starchy and contain less sugar than bananas so they’re better suited for savory dishes, whereas bananas are easily used in desserts or on their own. Hungry for more? Check out our recipe page for delicious plantain recipes! Or Ask Our Chef about how you can incorporate plantains into your menu!